"It’s not the end of the ideology, unfortunately," says Jürgen Stock, the Secretary-General of the organisation and the world’s top cop. "I think it’s a bigger challenge because of the complexity," he said. In an exclusive interview with ITV News, the former criminologist from Germany who now leads the world’s largest police organisation told me the eradication of IS territory has left a void that is being filled. Mr Stock says the fall of the caliphate has effectively led to the creation of a new organisation, a group he calls "ISIS 2.0" that will fight on FIVE fronts. Some militants will use guerrilla tactics in Syria and Iraq, while others will travel to growing conflict zones in Africa or south-east Asia. In many countries including the UK, new "home-grown terrorists" will be radicalised online, while some inmates completing sentences for terrorist offences will return to terrorism outside prison. But the prospect of some IS fighters in Syria returning to their home countries poses an immediate risk. Some will be "brutalised, trained, battle-hardened and maybe posing a threat in the countries where they come from," he said, adding: "Those who are leaving the conflict zones are leaving with a lot of contacts they made in Syria and Iraq. "We know many of these so-called foreign terrorist fighters were in the same camps, they were fighting side by side, so there is a huge network now which again is a challenge for global law enforcement and the (intelligence) community." Using data collected by member countries, Interpol has created a database of more than 45,000 IS fighters. But the member countries which have contributed to the global catalogue can chose to block certain other countries from accessing its files, should they wish. He said: "(In) less than a second, you can check whether a person internationally is wanted and who this person is because we have many examples where suspects were travelling across Europe and using multiple identities. "Sometimes ten, fifteen, twenty different identities, and because information was not properly shared amongst law enforcement or amongst different administrative agencies these people were able to do this." Mr Stock gave me a tour of Interpol's control centre, which lays bare the agency's huge scope for policing - staff members were presiding over events all around the world. 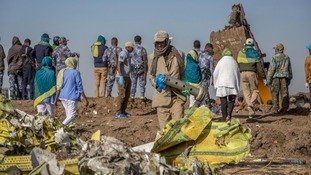 At the back of the room, officials and officers were on a video conference call with colleagues in Addis Ababa who had flown out to respond to the Ethiopia Airlines crash which killed 157 people from 35 countries. 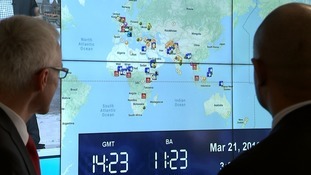 At the front of the room, officials gathered round a video screen showing a giant map of the world with flashing icons of exploding bombs and gunmen to indicate new emergencies and ongoing operations. Two icons were placed also over New Zealand following the terror attack at a mosque in Christchurch last week. The killings, allegedly by a white supremacist, might act as a warning of the role played by the tech giants in terrorism and extremism. Facebook live-streamed the killings and other platforms allowed video of the attack to be republished. Mr Stock says "internet service providers, tech companies need to do more in removing this material". He added how they should be "developing tools which can be used to do that, and close cooperation with law enforcement is crucial." Cooperation between law enforcement agencies is what Interpol is about and as the UK redraws its security relationship with the rest of Europe, the organisation believes it might have a role to play. "I think we can significantly contribute to mitigating any possible negative impact that Brexit might have," says Jürgen Stock. "So however Brexit looks like at the end there is still… access to 193 member countries by the UK through Interpol channels." He added: "The UK will retain access to our 17 databases so every police officer or any border official in the UK has access to the databases. "(They) can check whether a person is internationally wanted, whether a car is reported stolen, whether a passport that is used might be also reported stolen or lost.